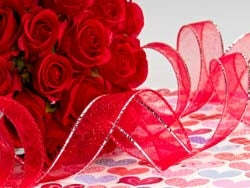 BB Crafts offer a wide variety of Valentine ribbon that adds a little romance to your Valentine cards. These ribbons are one of a unique product that our website has. Whether you choose a standard pure gold heart design ribbon or ribbon with dancing hearts, you should be able to find the right fabric from this carefully selected small valentine range. Whatever you do, have fun with these beautiful ribbons!!! These fabrics are frequently used to enhance the wreaths, baskets, table arrangements and other holiday decorations. Our Valentine's Day fabrics come in various colors, sizes, and patterns that are available at reasonable prices. You can find the perfect ribbon for Valentine's Day at BB Crafts because we offer a broad range of sheer, satin, and hearts ribbons for decorating or wrapping a gift. Browse our collection at wholesale prices that suit your budget also. Simply one of the best wedding supplies partner in USA. Have a huge inventory on colorful ribbons, tulle, deco mesh, tablecloths in our California Warehouse. Our prices are competitive and the quality of the products are of high quality. We undergone numerous research on the customer needs and carefully built this store for fast and easier shopping. Favor crew is a reliable wedding favor supplies company whom you can trust and work long term. Happy Shopping!! © 2019 Favor Crew. All rights reserve.